It has long been suspected, but research has confirmed the relationship between the equity interests of senior executives and the stock exchange performance of their gold-mining companies. A report published this week by the Shareholders Gold Council (SGC) has ignited the debate on the appropriate level of equity that a chairman or chief executive officer should have in the company that they manage. The SGC is a not-for-profit Canadian organisation launched two months ago to conduct relevant research into the gold-mining sector on behalf of investors. There are currently 17 members, and the first report from the organisation looks at the relationship between the value of executive equity in the company that he/she manages (expressed as a ratio of total compensation over the past five years) compared with the total shareholder return over that period. The relevant data was sourced from the Institutional Shareholder Service (ISS) and, for this initial study, 17 companies were evaluated. 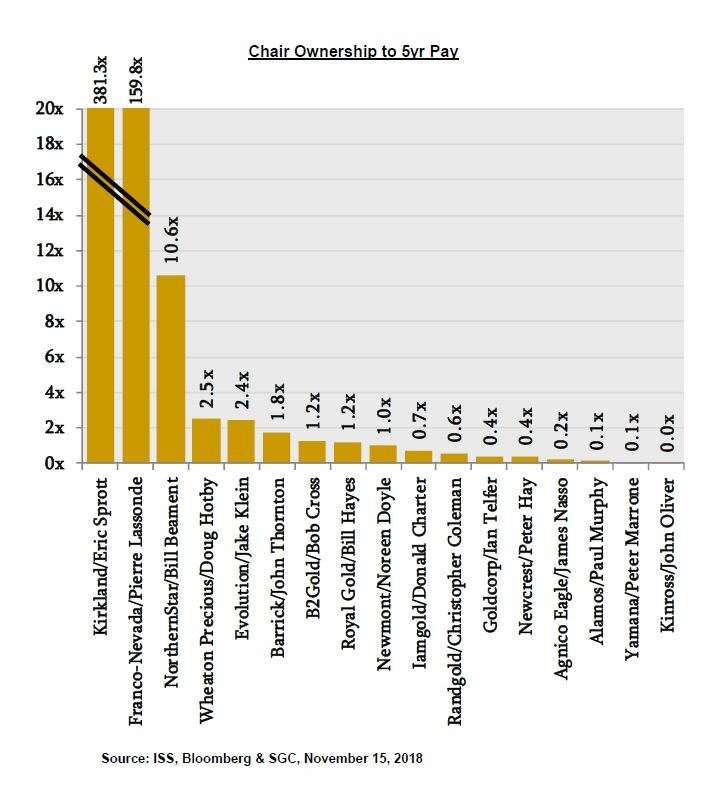 Looking at the chairmen of these gold companies, there were two outliers in terms of the value of current equity ownership as a ratio to the past five years total compensation; Eric Sprott of Kirkland Lake and Pierre Lassonde of Franco Nevada (as shown in the graph below). These two chairman owned equity worth 381x and 160x the value of their recent remuneration. Excluding these outliers, the results varied, showing 10.6x on the high end, for Bill Beament of Northern Star, to barely zero at the low end for Paul Murphy of Alamos, John Oliver of Kinross and Peter Marrone of Yamana. 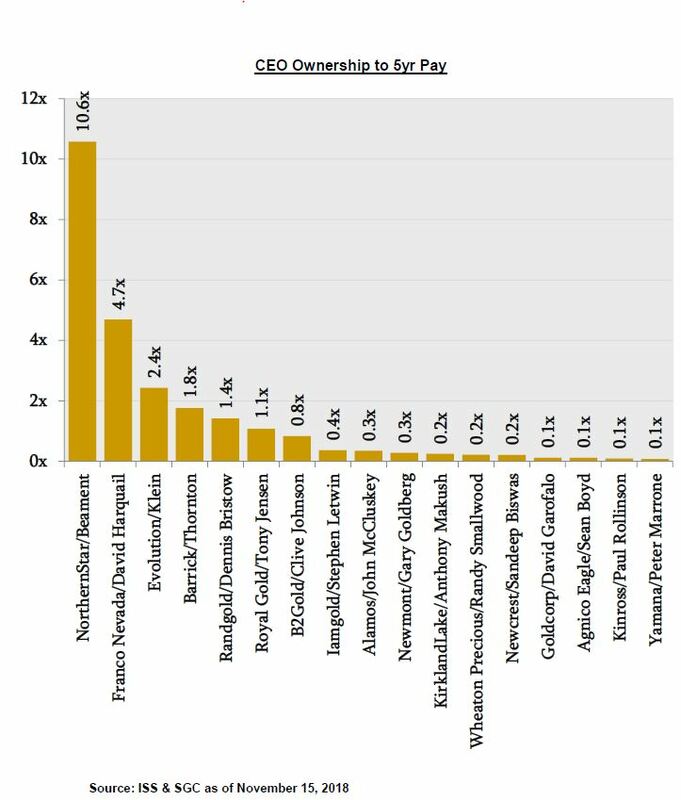 There was also a wide distribution for CEOs. At the high end, again, was Bill Beament of Northern Star with 10.6x and David Harquail of Franco Nevada with 4.7x stock ownership relative to pay over the past five years. On the low end, again, were Kinross and Yamana, where Paul Rollinson and Peter Marrone owned equity valued at just 0.1x their five-year remuneration. For Northern Star, Evolution, Yamana and Barrick, SGC included the executive chairman as the de-facto CEO. SGC then factored in total shareholder return over the past five years, as shown below. 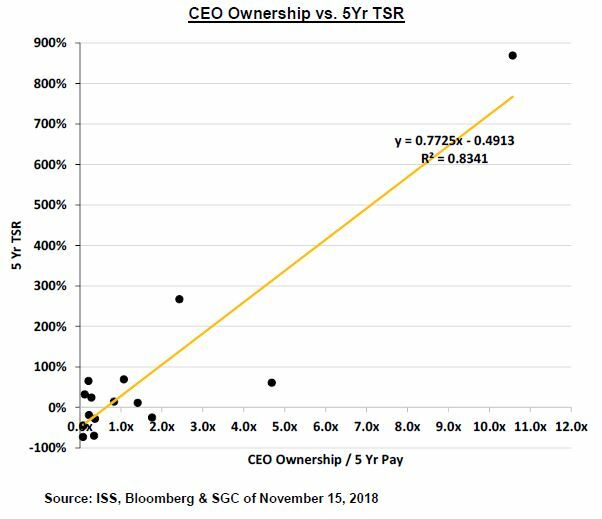 There was a clear relationship between the value of equity as a ratio of compensation for the chairman/CEOs and the total shareholder return, as shown in the two charts below (the one for chairman has excluded the two outliers). Speaking at the Mines and Money conference in London, the SGC's executive director, Christian Godin told delegates that by having similar financial incentives as the equity owners, management teams are incentivised to make decisions that maximise the corporation's per-share value. 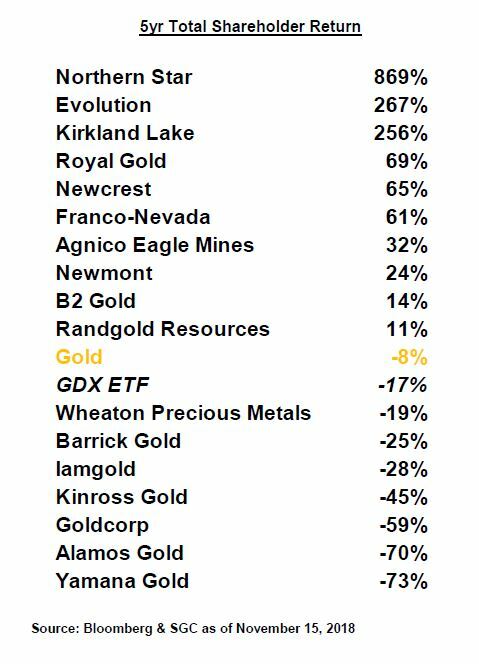 Mr Godin noted that seven of the companies monitored had failed to outperform bullion and gold exchange-traded funds over the five-year period, which he described as "unacceptable". He added that "too many people are underperforming, we think they have too little skin in the game". 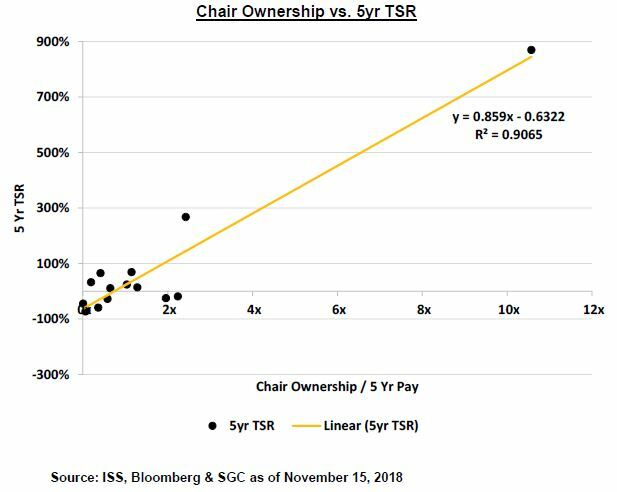 An appropriate level of equity for chairmen and CEOs is a value equivalent to about five years of total compensation. Mr Godin told delegates that the report proved "a clear and meaningful relationship between shareholder return and levels of stock ownership between CEOs and chairmen. He said that investors should seek companies whose leaders invest alongside them. SGC believes that the entire industry could improve returns on an aggregate basis by aligning itself more directly with stock holders, as equal owners of the companies.